Small volumes of PP recombinant protein vial(s) may occasionally become entrapped in the seal of the product vial during shipment and storage. If necessary, briefly centrifuge the vial on a tabletop centrifuge to dislodge any liquid in the container`s cap. Certain products may require to ship with dry ice and additional dry ice fee may apply. Capsid protein VP2 self assbles to form an icosahedral capsid with a T=13 symmetry, about 70 nm in diameter, and consisting of 260 VP2 trimers. The capsid encapsulates the genomic dsRNA. VP2 is also involved in attachment and entry into the host cell by interacting with host ITGA4/ITGB1. The precursor of VP2 plays an important role in capsid assembly. First, pre-VP2 and VP2 oligomers assble to form a procapsid. Then, the pre-VP2 intermediates may be processed into VP2 proteins by proteolytic cleavage mediated by VP4 to obtain the mature virion. The final capsid is composed of pentamers and hexamers but VP2 has a natural tendency to assble into all-pentameric structures. Therefore pre-VP2 may be required to allow formation of the hexameric structures. 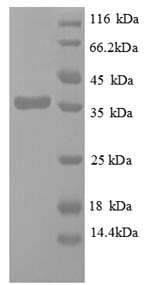 Protease VP4 is a serine protease that cleaves the polyprotein into its final products. Pre-VP2 is first partially cleaved, and may be completely processed by VP4 upon capsid maturation. NCBI/Uniprot data below describe general gene information for PP. It may not necessarily be applicable to this product. Capsid protein VP2 self assembles to form an icosahedral capsid with a T=13 symmetry, about 70 nm in diameter, and consisting of 260 VP2 trimers. The capsid encapsulates the genomic dsRNA. VP2 is also involved in attachment and entry into the host cell by interacting with host ITGA4/ITGB1 ().